Mega Moolah £10million Jackpot at Leo Vegas! Lord Bingo News Gaming Industry Mega Moolah £10m Jackpot at Leo Vegas! Mega Moolah £10m Jackpot at Leo Vegas! The race is on at Leo Vegas! So make sure you sprint into action and head on over to hunt down your share of the record-breaking Mega Moolah Jackpot! The word on the street is that the mega-star progressive jackpot is climbing and climbing – and has reached a jackpot-blasting £10 million! The hugely successful Mega Moolah adventure is known amongst players as “The Millionaire Maker”, and may just be the world’s most popular slot. This Wild African themed game offers 5 reels and 25 pay-lines of pure slot magic. Set in the enchanting Savanna, a herd of awesome wild animated characters have been unleashed onto the reels for a wild adventure. This means as you navigate your way through the safari, you'll be greeted by a host of Lion-King-style characters, from wild lions and endearing giraffes to super charming elephants and cheeky monkeys! While you adventure through the slot, the reels are also fully-loaded with Free Spins, and Scatters and Wild jackpot riches waiting to be uncovered. 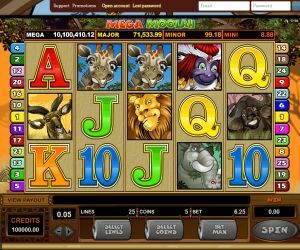 Mega Moolah offer a 4-tiered progressive jackpot, Mini, Minor, Major and the Mega, and it also offers three other super cool themes. These include a summer holiday theme, an awesomely ancient Egyptian theme and an all-American theme. The game is also linked to 5 other awesome games like the Dark Knight. With this epic game all the pulse-racing bets are pooled into a big megastar progressive jackpot, and there is no limit to how high the jackpot can climb! As the jackpot climbs and climbs, you better head over to Leo Vegas today to get in on the progressive jackpot Mega Moolah millionaire-action!